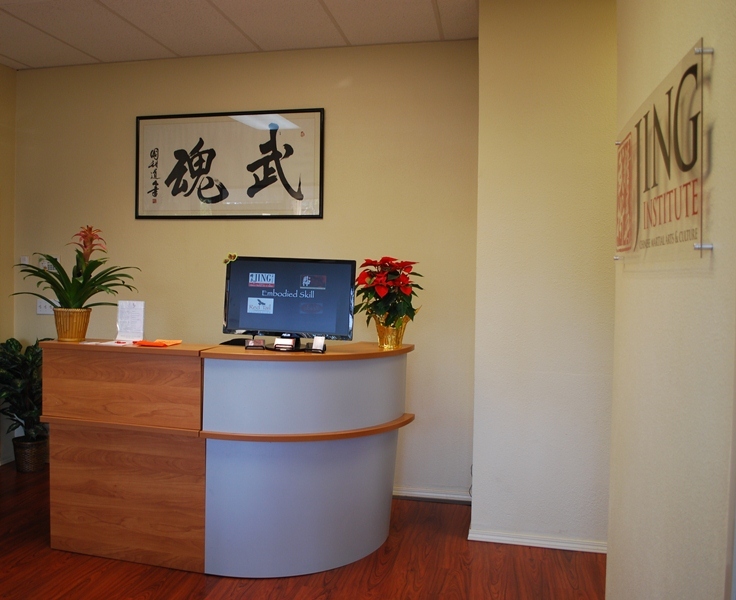 The JING Institute of Chinese Martial Arts & Culture! Our entrance in Scripps Ranch, just one block from the 15! 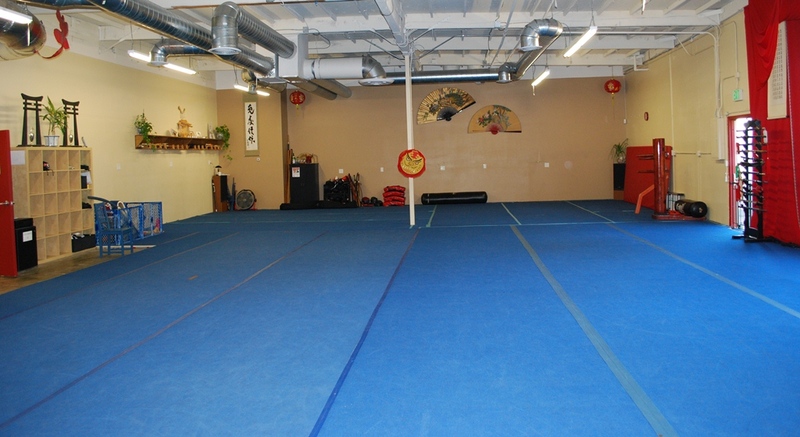 This is our Lobby, which we most gladly share with Red Tail Corporation, Ready 5, Bujinkan Taka-Seigi Dojo, and our own JING Kids After-School Program. The Calligraphy above the desk says "Martial Spirit" or "Martial Soul" -- it was commissioned by Siu-Fong Evans in 1995 from the Daoist monk Guo Tian (White Cloud Temple, Beijing, China) during our year-long stay in Beijing. 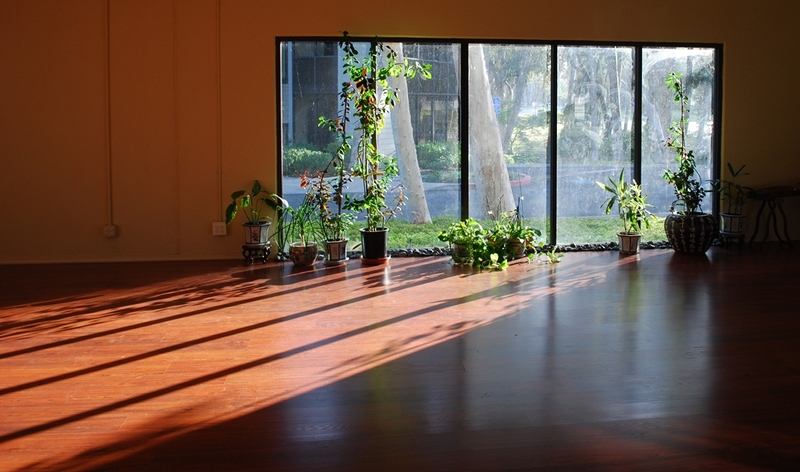 Jing Jing's Taiji Floor in the late afternoon light of winter. I love this floor because of its south- and west-facing windows. It's cool in the summer (we tinted the west-facing windows) and warm in the winter (I stand in the sunlight on winter mornings). The floor is a gorgeous Brazilian Cherry. The plants in this photo are usually spread out around the studio, but I put them in front of the south-facing window every weekend to give them some extra light. This is also used to be our JING Kids After-School floor. 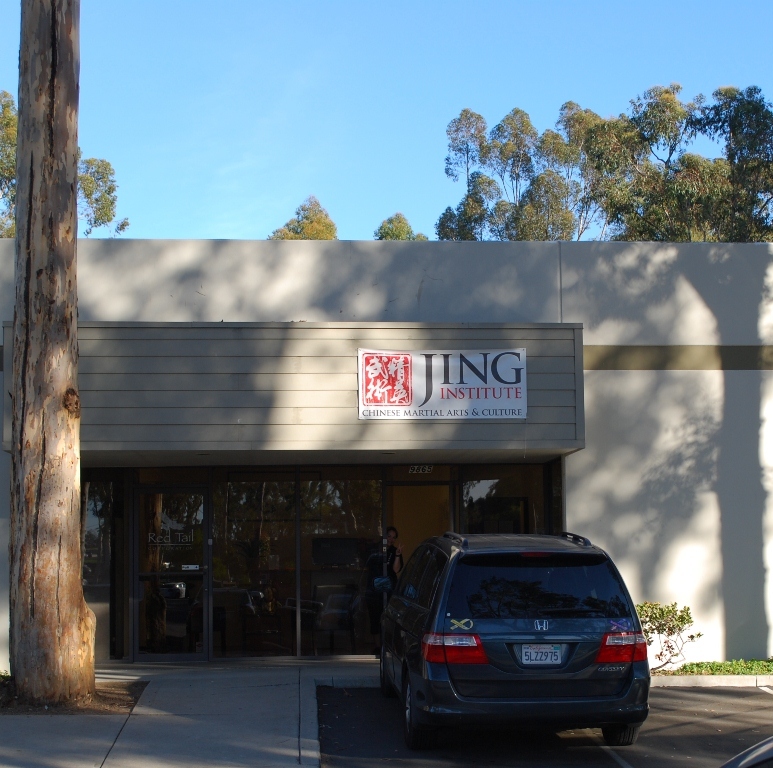 We have since moved JING Kids to the north side of the building (photos to come). Jing Jing's Guzheng on the Taiji floor. This is known as the "Couch of Doom." It lures unwitting athletes onto its comfy cushions, and does not let go. 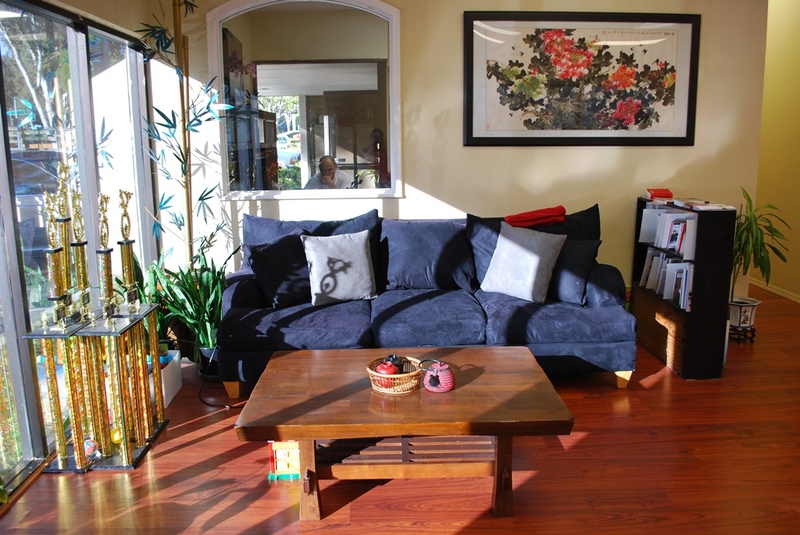 To the right of the couch you can see our small Library, populated with many Taiji and Wushu and Kung Fu books and DVD's; some Wing Chun books; and an entire shelf of Chinese Culture and Language books. If you look to the left of the couch carefully, you can also see our Bamboo of Doom -- a beautiful metal bamboo sculpture made by hand, by Siu-Fong's godson Vi Tang (Chen Style Taiji). We love it very much, but the leaves are terribly pointy, so we make sure that it's open to only visual appreciation. The traditional Chinese painting above the bookshelf is one of Jing Jing's favorite paintings - Peonies commissioned by Siu-Fong Evans when we lived in Beijing. 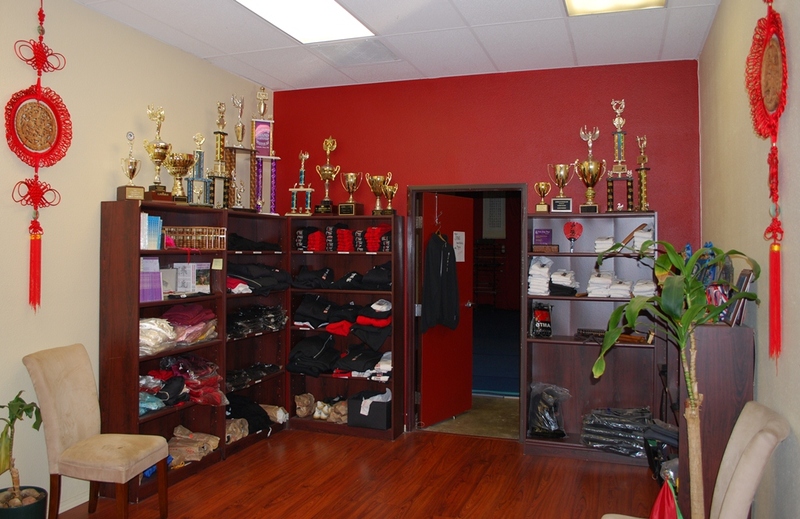 The trophies are from the 2011 American Karate Association Open. Go JING Taiji and Wushu! The JING Retail Area! Yes, I have since folded all the clothes neatly (I took this photo when we had just received a new order, before I took the time to fold everything). No, I have not yet put up the 160 or so Taiji and Wushu medals. But the trophies get the point across, yes? This is also the Doorway into Wushu and Wing Chun and Bujinkan. 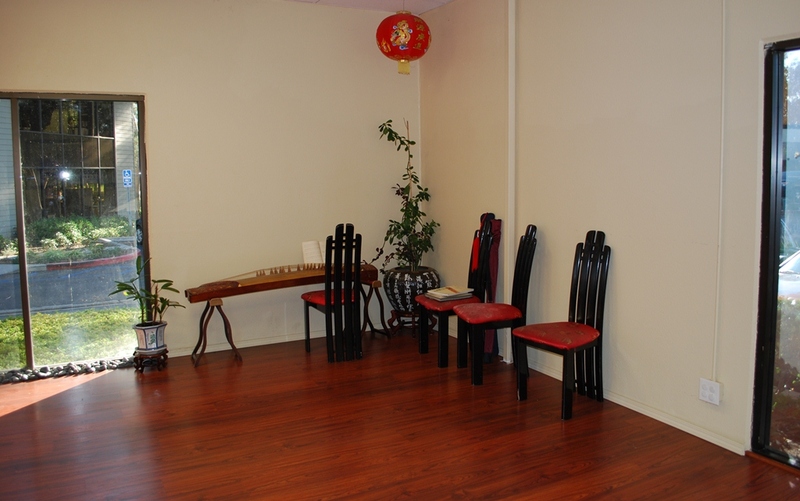 Welcome to what we call Big Floor in Chinese (大场地）, or Wushu Floor or Wing Chun Floor or Bujinkan Floor in English, depending on who we are talking to and what is going on! 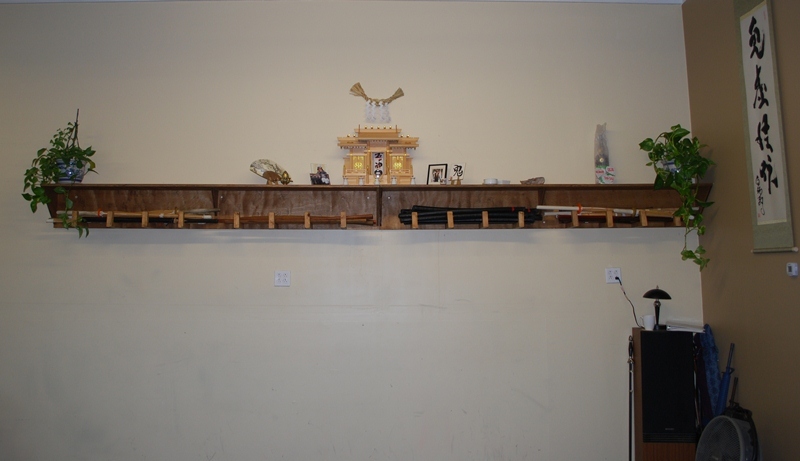 Jacob has since moved the Bujinkan shelf, actually. I will put up more updated photos...later. 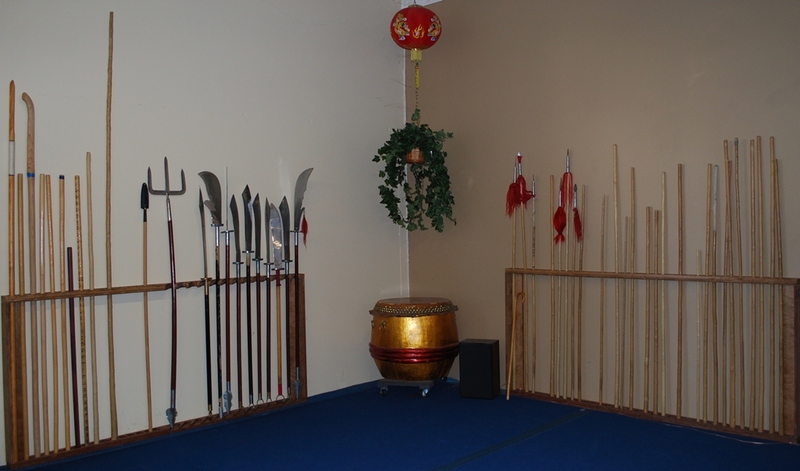 The Wushu Weapons Corner. Fabulous Weapons Racks designed and built by Jacob Crowl.